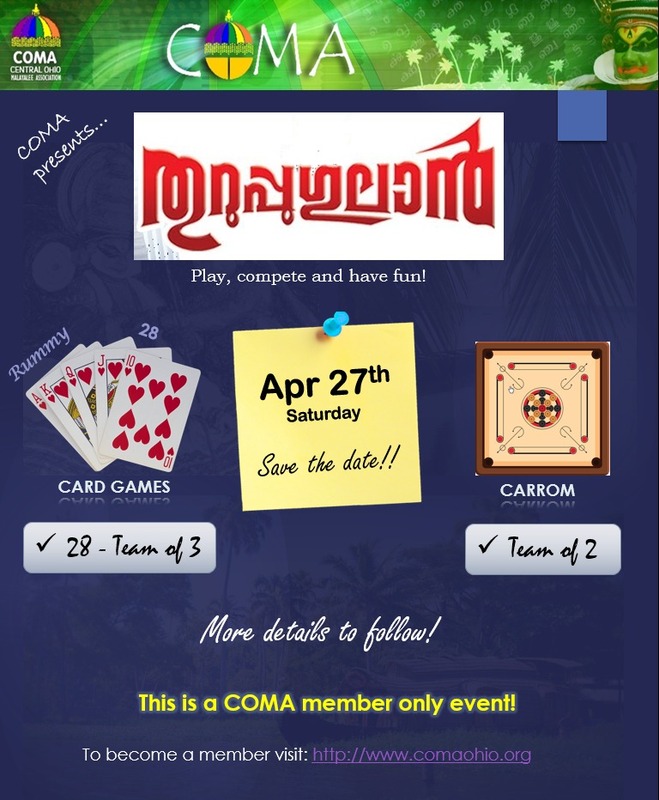 COMA presents Thuruppu Gulan – a games night for its members – includes 28 (Irupathiyettu) – the most loved card game of Kerala, Rummy – the most popular card game of Keralites and Carrom – most popular game in South Asia. Please fill in and submit the registration form below. This event is open for COMA Members Only. You may register/add any non-members to your team now; but make sure that they take membership before the event date. $15 per person (Includes Dinner Buffet). Please quick pay the registration fee to coma.officials@gmail.com after submitting the registration form below. You can play either 28 or Rummy (not both). You can also play Carrom if interested. 28 game will be done with teams of size 3. If you don’t have a team, you can register just yourself and we will add you to a team. If you are registering a team, other team members don’t have to register separately. Rules will be sent out a few days before the tournament. Depending on the interest of the participants, 28 or a variant (56 or 40) will be decided. Carrom format will be doubles. Enter you partner details while registering. if you don’t have a partner, we will assign you one. Carrom will follow the international rules of the game. Winners and Runner ups will receive trophies during the COMA Onam 2019 event. Dinner includes veg and non-veg appetizers, biriyani, nan, veg and non-veg curries and dessert. Alcoholic drinks will be available to purchase.